4 Pics 1 Word skiing. People on vacation. People skiing. Man on cliff. Guy looking at map. The puzzles in 4 Pics 1 Word are randomized, so the levels are different for each player. That means you can’t search by level number. You have to find your answers by word length. 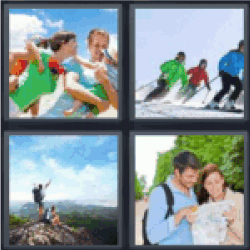 4 pics 1 word skiing.